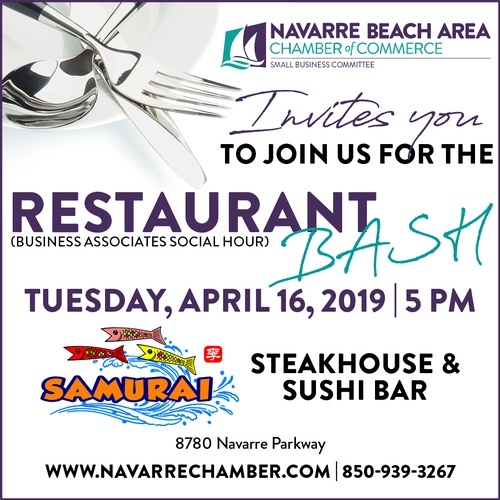 The Navarre Chamber invites everyone to join us for the Restaurant BASH (Business Associates Social Hour) at Samurai Japanese Steakhouse & Sushi Bar on Tuesday, April 16 from 5-7 pm. The Restaurant BASH is an informal networking opportunity to grow your business network, eat, drink & socialize with some friends and love on a Chamber Member Restaurant. There is NO COST TO ATTEND, however each guest pays for their own drinks & food. A Chamber representative will will greet everyone at the door and direct you to our area of the restaurant. The Restaurant BASH is also a boost to the Chamber Member Restaurant that gets some extra business thanks to the Chamber's efforts. It may also introduce new customers to the restaurant, and some restaurants may offer specials, just for the Navarre Chamber Restaurant BASH. You do not have to be a Chamber Member to attend - so please join us!